GulfCountyBusiness.com was developed in 1996 with one purpose, and one purpose only...to help folks find all they need to know about businesses located in and around the Gulf County, Florida area. It continues today with the same single-minded mision. While this site offers a host of other other useful information, you will notice the prominence of the site's business listings and links to the websites these businesses maintain. That is in keeping with this site's mission. Business listings on these sites will be made available only to businesses located in or doing significant business in the Forgotten Coast area. Acceptance of a business for listing on these sites is entirely at the discretion of Bluewater iNet Group, LLC. Businesses may request a listing by purchasing an annual sponsorship package. The total package cost is $150/year, and includes special recognition for your business as a site sponsor on not only this site, but on our MexicoBeachFL.com and BayNavigator.com websites and each of the other portal sites listed on our company website. Sponsorship benefits include a link from each of your listings to your company's website, inclusion in the Sponsors list of links that appears on pages throughout the site, and inclusion in the rotating banner ad link that appears at the top of pages throughout the site. 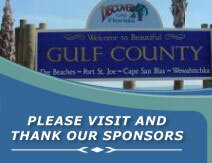 To include your listing, or to become a sponsor, simply CLICK HERE TO SIGNUP ONLINE. When we receive your request, we will add your listing and/or sponsorship links and drop you a bill in the mail. It's that easy!